While sound marks the “true North” of the ecopoetics compass, Northeast and East point to conceptual and procedural writing and to documentary and research poetics, respectively: modes of writing keyed explicitly to the past. Conceptual and procedural writing occupy the Northeast front out of their instructive orientation to European modernism (more explicitly than any orientation to more recent developments in poetics around the globe), while documentary and research-based practices work directly with history, and/or what has been documented, as their primary material. They orient attention against the movement of solar time, heirs to an Enlightenment quest to know what the day has so far illuminated—and what, as the case may be, official histories have obscured. Situationist work engages the dérive of research, turning the compass Southeast toward unknown outcomes. The unknown can emerge as much from standing one’s ground as from pursuing detours, and some of the poetics in this direction emerges from an explicitly activist stance, literally placing or displacing poetry into public space and other less evidently poetic contexts, such as governmental hearings, farming, or architecture. Sometimes poetry goes undercover and is reframed as an architectural bureau or an art review. Here we find the practice of “poetry by other means,” a reframing that situationist work holds in common with conceptual poetics—the difference being that conceptual practice emphasizes the aesthetic dimension while situationist practice may be tied more explicitly to political outcomes. As we turn South, we face the border and the boundary work that characterizes ecopoetics, as a practice of the ecotone. Ecopoetics entails working creatively with edges and the exploration of systems (ecosystems, economic systems, political systems, immune systems), from the inside as well as the outside, a doubled stance that poetry is especially adept at assuming. Borders above all entail acts of translation. Turning Southwest, toward the future, boundary work becomes a practice of interstices, of thinking and making between: between writing and drawing, between digital and analog, between international modernist and traditional lineages, between North and South, in ways that seek to undo these binaries, or to develop them as complementary rather than opposed. “Mestizo poetics” seek a way forward without the myths of cultural and ecological purity that have been so frequently deployed to resist Western logocentrism. A new form of resistance to the “spell” of alphabetic literacy draws as much on European modernist innovation as on traditional indigenous practice (and in both cases, the “oral” interfaces of new communications technology and social media are inescapable). The landscapes of the future shelter healthy native plant associations but they also make room for “planetary gardens” of vagabond species, in a necessary coexistence of the place-bound and the nomadic. Thus the ecopoetics compass closes on a Northwest of disrupted/ third landscapes. While the Romantic imagining of pristine landscapes still frames much American literature, its environments are now pervasively marked by “third landscapes”—disturbed ground, neither preserved nor cultivated. How does poetics engage this territory of weedy innovation? The West, as it has been for so long in American culture, is reserved for the big picture: what are the prospects for humanity on this fragile lifeboat Earth? How do we imagine the landscapes of the future and what does their current condition tell us? What are we doing here anyways? Such questions haunt ecopoetics, whatever its bearing, and more than anything define its scope. North America has a broad tradition, going back at least to Thoreau’s “Walking,” if not much further, of literary environmental essays, essays that imagine, reimagine, and contest the American (and the planetary) landscape, on an epic scale. Such writing has been where the foundational assumptions and concepts of environmentalism get tested, challenged, and reworked (this challenging process is often lacking in much popular environmentalism). Nonfiction also is where ecopoetics meets science. Nonfiction has been the preferred terrain of ecocriticism and, indeed, of ecopoetics—insomuch as ecopoetics does much of its intertextual work with nonfiction. I suspect that many writers in ecopoetics might consider their poetry a form of nonfiction. How useful is such a compass in navigating the open field of ecopoetics? Does it constrain more than it enables? Can ecopoetics do without some attempt at broad conceptualization? I would love to hear your thoughts. I have deliberately left the names un-inked, on the hand-drawn map (posted above) that I shared with the audience at my recent Naropa talk (2011 Summer Writing Program): as has been my approach since the inception of the journal, ecopoetics is not about lists of names, or about who’s in, who’s out. I’d like to think of it, rather, as a work of networks and nodes of relation, cultivating the edges and friction between differing approaches. (One could also include other bearings located along, within, or even against the schema provided here. I have penciled in three further directions, within the North by Northeast quadrant: Sightings, Proprioception, and Placing/ Spacing Landscape.) 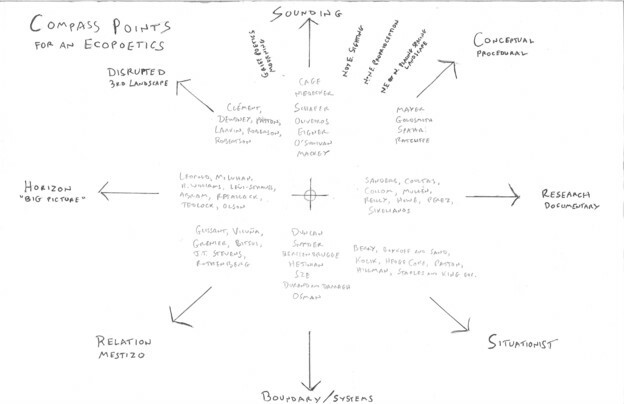 Over the coming two months, I’ll resort to this compass, from time to time, to attempt to relate the individual instances of ecopoetics I consider and to illustrate some of the generalizations offered in this brief summary. We’ll see what, if any of this, holds up.